We are proud to introduce our new premium lines of insert clocks. Available in Mid-June of 2015, our new line of 2-3/4” Insert clocks are solidly built with a real polished brass bezel, A curved glass lens, 3 black metal hands and a top quality quartz movement. Even better, they operate on a common AAA battery. All of these new insert clocks are designed to use a soft rubber gasket to firmly hold the insert in a 2-3/8” mounting hole. Our soft rubber gasket mounting system also allows you some flexibility about the size of the actual mounting hole. 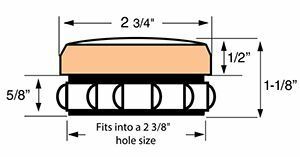 You can adapt these new inserts to a larger 2-1/2” to 2-5/8” hole size by removing the soft rubber gasket, wrapping the back of the insert with plumbers Teflon tape or electrical tape to “build Up “ the back of these insert clocks. Then re install the soft rubber gasket to adapt to a hole size larger than 2-3/8”.